Events are held at various locations within the Wyndham and Hobsons Bay area and commence at 9.30 a.m. The program is usually finished within an hour, and minimal numbers of officials are required. This season Werribee will also be joining with Altona, Brimbank and Williamstown for some runs. 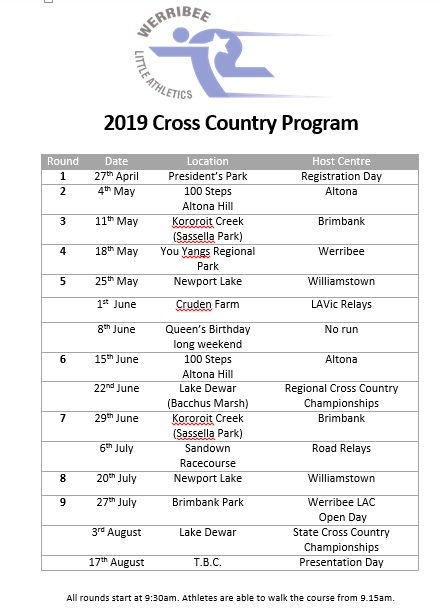 Summer season WLAC registration also covers athletes for the Cross Country season, however there is an additional charge of $25 per athlete to help cover Presentation Day costs. New members are welcome to join WLAC for the Cross Country season. Please visit www.lavic.com.au to finalise your registration. The 2019 Winter Fee is $80 per child.